Aladdin is special to me for being the very first Disney movie I ever watched, and perhaps the only one I–according to my parents–would cry at the end of, as I apparently wanted them to rewind the VHS tape and play it again. I couldn’t tell you what I saw in it over 20 years ago, of course. Considering that I watched it for the first time as an adult recently, I can tell you what I think of it now: despite some plot holes and glaring problems in the geographical and cultural setting, Aladdin is a rollicking, hilarious, romantic, and progressive (for its time) cartoon. When street rat Aladdin frees a genie from a lamp, he finds his wishes granted. However, he soon finds that the evil has other plans for the lamp–and for Princess Jasmine. But can Aladdin save Princess Jasmine and his love for her after she sees that he isn’t quite what he appears to be? It was extremely difficult for me to summarize the plot of Aladdin without going into great detail as to what happened in the beginning. I think that this is because Aladdin’s turning point, that of meeting Genie and trying to win Jasmine’s hand as a prince, doesn’t occur until a good one-third into the film. That’s not necessarily a bad thing, as I enjoyed the somewhat tuneless preamble leading up to the second Cave of Wonders sequence. You know what else I enjoyed? Aladdin and Jasmine, from start to finish. I feel like there is no other Disney movie where the chemistry between the hero and the heroine is this strong. Aladdin turns into a real goofball when it comes to Jasmine, so much so that I can feel a goofy smile growing on my face whenever they’re about to kiss or when the “A Whole New World” number came up. 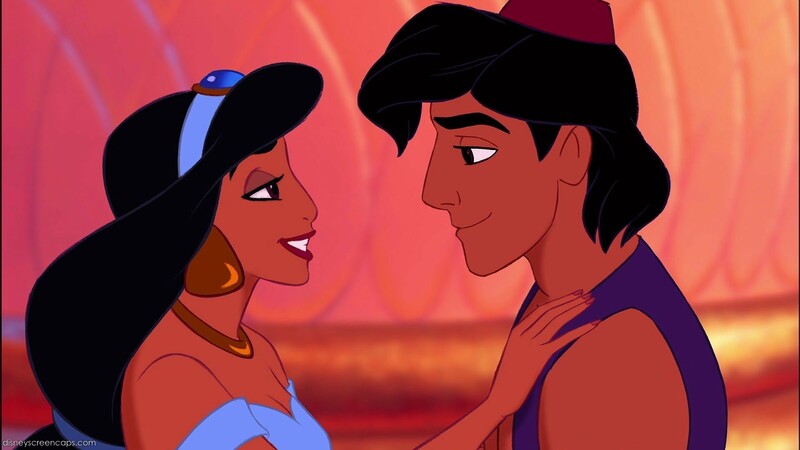 Even if the next two films and the animated TV series weren’t as good as Aladdin, I’m glad Aladdin and Jasmine got that much material and screen time to further develop their relationship; they are by no means perfect and they often have misunderstandings, but that’s just part of their charm. Jasmine herself is a pretty admirable character, perhaps the first example of the naive-but-fiery-and-capable-princess trope. She can’t handle a bow like Merida or a sword like Mulan, but she’s every bit as willing to fight to protect what’s important to her like Nala, and even as willing to trick her way into achieving her aims like Megara and has all the sexuality of Esmeralda. I may have wanted to be her when I grew up. The film–in glorious 2D that’s all but disappeared from mainstream US animation–has a rocking color palette that isn’t at all shy about going from warm to cool undertones from one scene to the next. Appropriate when you consider that the “A Whole New World” sequence is basically a preview of the settings of future Disney movies, like Hercules and Mulan. I also very much enjoyed how Carpet was animated–it takes a lot of skill to be able to draw a rug that can express its emotions without any voice acting. Plus, its pattern was beautiful. Speaking of voice acting, Robin Williams in his turn as the Genie was especially stellar. Scott Weinger does a pretty good job as Aladdin, too. I did have to wonder, however, about some plot points. Why Jafar didn’t just attempt to marry Jasmine in the first place if he wanted to take over Agrabah so much? He clearly had the resources–the snake staff–to do it, and if he’d done that in the first place, he’d have had access to enough resources to storm the Cave of Wonders, or else to discreetly detect Aladdin’s presence in the marketplace. I was also thinking the whole time I watched the Sultan, how did this happy-go-lucky guy who doesn’t take anything seriously get to lead a whole country? I mean, Jasmine was so upset when she thought that Jafar had had Aladdin beheaded, and he thinks that talking to both parties as mediator is going to appease either one? And yet, it’s that same quality of the Sultan’s that finally allows Jasmine to choose Aladdin as her husband, so I guess it’s all good…? Maybe I wouldn’t have enjoyed Aladdin as much if I’d first come to it as an adult, but who cares? The bottom line is that it gave me so many feelings and I’m still singing out “Prince Ali, fabulous he, Ali Ababwa” at random times throughout the day.